The Biopharma Recycling Program allows customers to fully recycle single-use and disposable products. Last year, MilliporeSigma engaged 21 biomanufacturing sites to recycle more than 1,300 tons of single-use waste. With this progress, 2,916 tons of waste have been transformed into new products, such as parking stops, speed bumps and plastic pallets, since 2015. By 2020, the company aims to recycle 5,500 tons through this program. As a result, MilliporeSigma estimates that this program has reduced carbon emissions by 1.8 million kilograms of carbon monoxide—equivalent to the amount of emissions produced when using more than 800,000 liters of gasoline. Customers also have the opportunity to recycle their lab water purification cartridges through the ech2o® Cartridge Recycling Program. In 2018, MilliporeSigma saw a 19 percent increase in customer adoption of this program—receiving and recycling 1,162 cartridges. Now, the company has recycled 4,413 cartridges and engaged more than 275 customers in recycling this waste into new products. 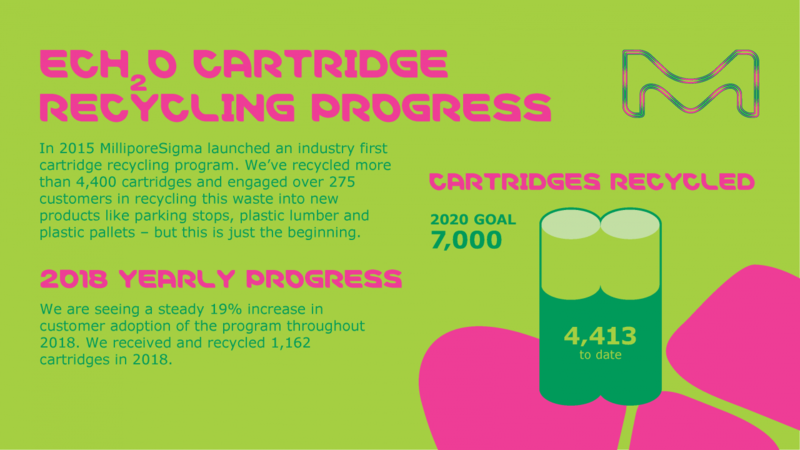 MilliporeSigma’s goal is to recycle 7,000 cartridges by 2020. 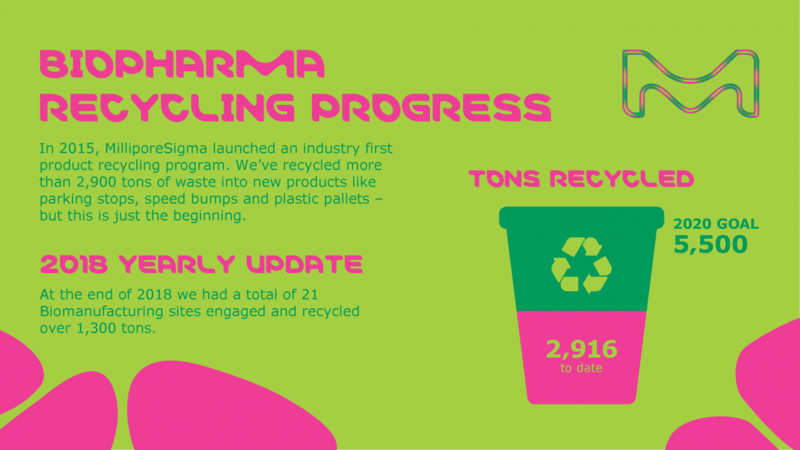 Through its support of the circular economy, MilliporeSigma is changing the way the world looks at waste.